Ressa was formally arrested on Wednesday, JJ Disini, one of her lawyers, told CNN, adding that she would head to night court in Pasay City to post bail. Earlier in the day, she was served an arrest warrant by the Philippines National Bureau of Investigation (NBI) officers, Rappler reported. Rappler said the charges are over an article it published in 2012. Ressa was indicted in relation to that case last week, which Amnesty International criticized as "yet another absurd legal attack" that amounted to "harassment." Rappler said authorities attempted to stop some of its journalists from filming the proceedings against Ressa on Wednesday, and that one officer who declined to give his name to reporters threatened to "go after you too." CNN attempted to reach the Philippines NBI by phone but the bureau did not pick up. Rappler's extensive reporting on President Rodrigo Duterte's brutal war on drugs has earned praise from human rights advocates, but has made the site and its journalists a target by supporters of the Duterte administration. Time Magazine included her among its selections for the 2018 Person of the Year award, which honored journalists who have been targeted for their work. Philippine prosecutors filed five cases related to tax evasion against Ressa and Rappler late last year. Some of the charges allege that the company failed to declare about $ 3 million in 2015 on tax returns from an investment by the Omidyar Network, a fund created by eBay founder and philanthropist Pierre Omidyar. "I've long run out of synonyms for the word 'ridiculous.' The basis of this case is that Rappler is classified as a dealer in securities. I am definitely not a stockbroker, "Ressa told CNN after news of those charges broke. Duterte's office has denied he is involved in the prosecutions against Rappler, but the President has previously sparred with the company's employees, personally barring Ressa and reporter Pia Ranada from Malacanang Palace, his official residence, over their coverage of his administration. 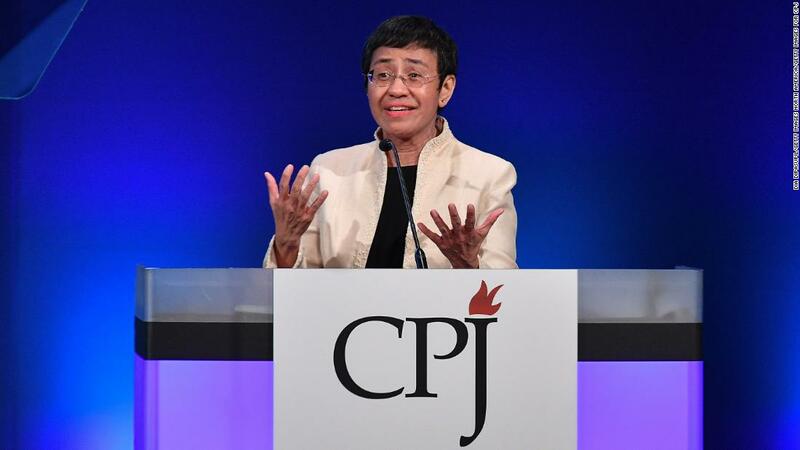 Ressa worked for CNN before starting Rappler, an online news site that has Since becoming an indispensable source of information for readers in the Philippines and internationally. CNN's Karen Smith contributed reporting.